Between 1831 and 1854, the French anatomist Jean-Marc Bourgery and his compatriot Nicolas-Henri Jacob, a versatile artist, produced a richly illustrated and ground-breaking medical textbook. The “Traité complet de l’anatomie de l’homme”, an atlas of descriptive and surgical anatomy, was published in eight volumes. The work is regarded as a scholarly and artistic masterpiece, and continues to influence the aesthetics of the representation of human anatomy to this day. In their treatise, Bourgery and Jacob provided a comprehensive survey of the state of contemporary medical and surgical knowledge. They collaborated closely, with anatomist Bourgery writing the text and supervising the preparation of the material to drawn by Jacob. “The close synergy between science and art was what enabled the authors to depict clearly the spatial dispositions of body parts and accurately depict their internal structure,” says Natalie Lauer. Unfortunately, neither Bourgery nor Jacob received the recognition that their monumental achievement richly deserved. In 1843, the work was awarded the Prix Monthyon, but very soon after the appearance of the final volume, the work slipped from public view. “Many of the illustrations were reused in other contexts, with no indication of their source,” says Lauer. The main reason for this undeserved disregard was Bourgery’s lowly position in the hierarchy of his profession. He was not a member of the French Academy of Sciences, and was largely unknown in academic circles, in spite of the significance of his anatomical research. In the prefaces to each of the published volumes, he pointedly refers to his outsider status. Nevertheless, he devoted more than two decades of his life to the Traité. 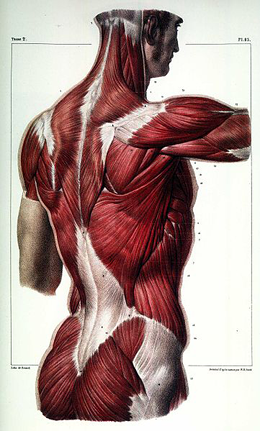 “He was motivated by the desire to perfect the art of medical illustration,” says Lauer. Bourgery died in 1849, five years before the last volume saw the light of day. The style and design of the illustrations in the atlas was entirely novel and set the standard for later books of this type. For reproduction, Jacob’s drawings were transferred to lithographic plates and printed using the best technology available at the time. As Lauer shows in her doctoral dissertation entitled “The Draughtsman’s Contract with Medicine”, which has now appeared in book form (see below), the Traité caught the attention of the authors of popular books on medicine, and the illustrations had a significant impact on the graphic arts, influencing the architectural drawings made by Viollet-le-Duc, for example. But the books themselves never became well known to a wider public. Indeed, in 1909, the librarian Noé Legrand claimed to have discovered Jacob’s original drawings, which served as the basis for production of the lithographic plates in the atlas, in a bouquiniste’s barrow on the Pont-Neuf in Paris. Verlag Königshausen & Neumann, Würzburg, 2013, 238 pp.